This entry was posted in Community of Christ, Peace and Justice. Australia is going to an election in September where the national government will be elected. Australia has benefited greatly from multiculturalism, but still faces struggles with xenophobia in some parts of the community. Frustratingly, both of the major parties pander to this xenophobia and perpetuate it, promoting policies which force asylum seekers into sub-standard detention centres built on remote pacific islands, where many succumb to depression and self-harm. While Australia’s economy has been strong through the Global Financial Crisis, it has come to rely more and more on mining and natural resources, which brings challenges to not only environmental justice, but also Aboriginal native land rights. Australia was recently elected to the United Nations Security Council and is in a position to contribute to major decision making on peace and conflict issues around the world. There are other issues Australia is dealing with (walking past the homeless on my way to work makes it clear that there’s still a lot of work to be done on economic/housing justice), but I hope this will help those planning a prayer for peace for the coming Sunday. Thanks, Rick — I appreciate that update! Canada has had some of the same issues in the wake of the Global Financial Crisis, including the controversial focus on exploiting tar sand oil (an extremely dirty fuel that is extracted and transported only with large environmental impacts) and also the rights of First Nations peoples. Could you also give us a paragraph about the roots of the church in Australia and perhaps something the church in general there or even a congregation is doing that relates to mission initiatives or peace and justice issues in the country? Having only lived in Canberra (where there is no Community of Christ congregation) since returning to Australia after a few years absence, I’m not all that up-to-date on the efforts of our congregations or Mission Centre to take peace and justice action. I also don’t have a lot of my church history notes on me, but I’ll see what I can find. Hi John, I’m also from the Australia Mission. A have an example for you from one of our congregations – Frankston, in Victoria. Seeing a need in their community amongst families of a lower socio-economic status, they took initiative to run free camps for families in the area to “get away”, who otherwise would not have the opportunity to step out and take some R&R (and connect with other folk). To my knowledge they have recently facilitated their second family camp at our campgrounds, Kallara. Some of the families have begun to take part in regular congregational and state-wide activities. One family even moved to another town, and looked up the church there to attend worship and participate in community. It’s turning into a great outreach community, supporting mission initatives (Congregations in Mission, Invite People to Christ, End Suffering). The Perth congregation also run a fantastic Food Pantry and outreach service – you can contact Ben Smith (bsmith@cofchrist.com.au) for more information on that. I believe they recently won a Government Grant to extend their services. Karli: This is wonderful, thank you! I have had similar issues with the prayer for peace for years. Back in 2006 I pointed out to them that their information about having mostly Labor governments in recent memory was completely out of date neglecting that for the previous 10 years we had had a conservative government. I feared that so many of the others were out of date. Not long later, I attended a prayer for peace in the Temple for Hungary. The person leading the prayer for peace followed the script and was apparently unaware that there had been rioting there in the previous day or two. We need the basics of the countries’ long term issues to be clearly stated, but we also need the person leading the prayer for peace to at very least do a google news search for that country before leading the prayer. The prayer for peace is a responsibility, and on the whole, I’m not sure we’re doing it justice. For me, a best case scenario would be a brief overview that talks about the people, the richness of their culture, what the country takes pride in. Then a discussion of a particular peace and justice issue struggle the country faces and, where possible, an individual story of a real person. Then have the prayer tied into that issue. All the countries should be presented with the same degree of dignity, so that this isn’t a roster of rich nation smugness and poor nation atrocities. Rather, we see the worth and dignity of all persons and acknowledge and pray on behalf of the individual peace and justice struggles that everyone faces. An Episcopal congregation I worshiped with did something that might be adaptable to the Prayer for Peace as a way to address some of the concerns John identifies. The Episcopal Sunday liturgy includes a section called “Prayers of the People.” The congregation I’m thinking of incorporated a couple different “prayer cycles” into their weekly Prayers of the People, akin to Community of Christ’s custom of praying for a different country each week. In one of the congregation’s prayer cycles, the “Anglican prayer cycle,” the priest would name a diocese somewhere in the worldwide Anglican Communion (of which the Episcopal Church is part) which the congregation was including in their prayers that day. In the other prayer cycle, their “ecumenical prayer cycle,” the priest would name another Christian denomination for special inclusion in that day’s prayers. In addition to these prayer cycles, the Prayers of the People included periods of silence in which any member of the congregation could voice prayers that rested on their hearts. Someone always prayed for the U.S. president. Someone usually prayed for peace in Iraq and Afghanistan; someone else would mention the Middle East. A social worker in the congregation regularly prayed for children in the state foster care system and for their providers. People would chime in with personal concerns, or with needs that had been in the news lately. A Community of Christ might follow that pattern for the Prayer for Peace: prayer cycle + extemporaneous petitions. 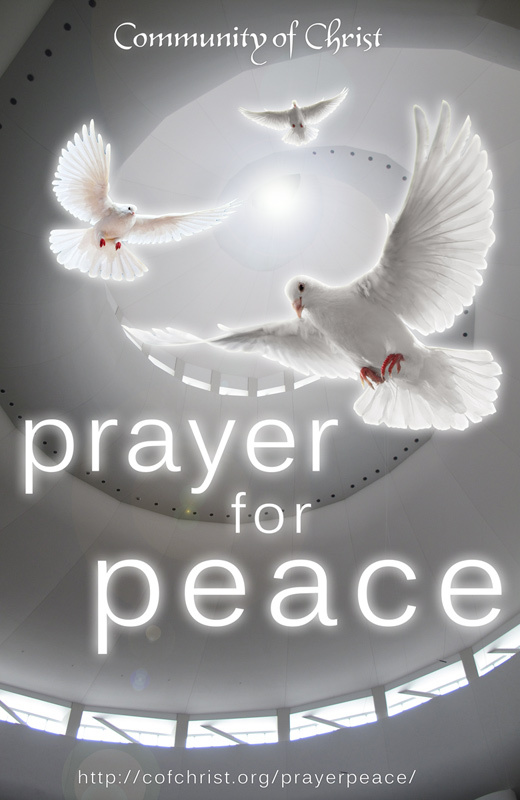 As one part of the Prayer for Peace, a worship leader names the nation specified in the church’s “world prayer cycle.” In addition, a period of silence is observed, in which members of the congregation are free to either pray silently for whatever additional peace-related concerns weigh on their hearts, or to voice those prayers aloud. These might be prayers for peace in other nations,within our own nation, in our local communities, or in the lives of specific families and individuals. So someone who’s concerned about Syria can name Syria, even if Syria isn’t the nation that came up in the world prayer cycle that day. Someone else could pray for an end to gun violence. Someone else can pray for constructive bipartisanship in Congress. Someone can pray for the peace of mind of a friend experiencing difficulties, etc. Hi there, I’m jumping into this “conversation” two years after it was initiated by the article and I find the the published Prayer for Peace calendar hasn’t changed as per your recommendations, as far as I can tell. I came to this discussion because I felt that this Sunday it would be much more appropriate for us to be praying for Syria and specifically for Syrian refugees rather than the scheduled country, Lebanon. (Which is another peeve I have: folks don’t feel they have the license to switch out countries if there has been a dramatic world event which warrants our prayers, say, France last Sunday, after the terrorist acts on Friday.) So I initiated a search for the past PFPs for Syria and found exactly what you mentioned, John: GDP and so forth. So I’ll do what I find myself doing far to often when presiding….craft my own text portions of the service.